This morning, the Council adopted a policy on creating new Self-Managed Special Service Districts in Minneapolis. This will allow business districts to form special service districts that they manage and control, if they want. My office worked to ensure that this policy works as well as possible for existing neighborhood business associations that may want to manage special service districts. The Council voted to create two governance models, at the request of business stakeholders. One allows a Downtown Improvement District-style “Management Entity” that decides on budgets, services to be provided, and assessment models, while also providing services. The other model would create a new City Advisory Board for the district that decides on budgets, services, and assessment models, and allow an existing nonprofit to provide the services and day-to-day management. I offered a successful amendment to clarify that there could be some overlap between the Advisory Board and the Service Provider, after hearing concerns from West Bank stakeholders. The original staff recommendation was that no members of the Advisory Board could serve on the Service Provider board, to avoid the appearance of a conflict of interest. But staff had already ensured that there could be no financial conflict of interest, because neither the Advisory Board nor the Service Provider board members can be paid for their service, per the policy. My amendment was to allow no more than 50% of the Advisory Board to be made up of Service Provider board members. This work was done very quickly by a group of City staff, and I want to thank them individually: Ben Hecker, Andy Carlson, Mike Kennedy and their consultant Michael McLaughlin. I also want to thank the West Bank Business Association, Lake Street Council, Cedar Riverside Partnership and Carol Becker, among other stakeholders, for participating in the public process to develop this policy. I have recently been getting a number of questions and concerns about a new project I am working on that would formally permit and regulate Trap Neuter Return programs in Minneapolis. Under the proposal, nonprofit groups working with individual residents would be allowed to conduct what are called “Trap Neuter Release” or “Trap Neuter Return” (TNR) or, more accurately, Trap Neuter Vaccinate Return programs in Minneapolis. The City itself would not be conducting the programs. This proposal would add an additional tool or practice and would not eliminate any of the other policies or practices currently in use by Minneapolis Animal Care and Control staff. Some TNR programs have already been operating in Minneapolis but some of the practices involved conflict with current law. I believe there will be benefits to better regulating them. I am working on this because I believe that feral cats pose a significant health, safety, livability and environmental concerns in some areas of the city and that our current policies and practices are not effectively addressing these issues. Feral cats are clearly responsible for killing an enormous number of birds and other wildlife in the US each year. Allowing TNR programs to be well-regulated under thoughtful guidelines and with the oversight of our professional Animal Care and Control staff will help us better evaluate their effectiveness. It will also offer us a potentially effective and affordable way to address the out-of-control growth of the populations of wild cats that spread disease, kill birds and other wildlife, create offensive smells, damage property and disturb residents. It will also help us curb the sometimes unwise, although often kind-hearted, efforts of people who try to care for these cats while engaging in behaviors that actually create more problems, including attracting rats, mice and other unwanted pests. It is my understanding that colony of neutered cats is less likely to grow. Cats are territorial. The presence of healthy, neutered animals will discourage other feral cats from moving in. Neutered cats are less likely to fight among themselves, contract disease or spread disease and spray urine. Over time, my hope is that their numbers will actually decrease, as no new kittens are born. If not spayed, females can have several litters each year. It has been estimated that if one cat had only one litter of five kittens per year, and each of her female offspring has a single litter per year, that cat would be responsible for producing over three hundred cats in just four years. Returning a neutered cat to this niche will, TNR advocates hope, prevent this explosive population growth. One thing I want to be clear about is that the ordinance changes I am proposing will not take any current tool away from Animal Control staff. It will only add another tool into the mix. Animal Control staff will still have the authority to kill a stray cat after it has been held for the necessary time (5 days), has been checked for Identification to return it to an owner and has been an assessed to determine if it is suitable for adoption. Last year, the city took in 303 live cats suspected of being feral. Of those, 23 left the facility alive, either reunited with an owner, to another shelter or to a new owner after being adopted. Seven died while in the facility and 270 were euthanized. Even if the law is changed to permit organizations to implement TNR programs, I don’t expect the number of cats being killed to go down immediately. Over time, however, as more cats are sterilized and returned to their caretakers, the number of feral cats being brought in may indeed go down as fewer cats are born. TNR programs are allowed in many cities throughout North America, including St. Paul. Here is something from Project TNR, a program of Animal Protection League of New Jersey, where TNR has been being practiced for several years. “Trap-Neuter-Return, commonly referred to as “TNR”, is the only method proven to be effective, humane and cost effective in controlling feral cat population growth. Using this technique, all the feral cats in a colony are trapped, neutered and then returned to their territory where caregivers provide them with regular food and shelter. Young kittens who can still be socialized, as well as friendly adults, are placed in foster care and eventually adopted out to good homes. “TNR has many advantages. It immediately stabilizes the size of the colony by eliminating new litters. The nuisance behavior often associated with feral cats is dramatically reduced including the yowling and fighting that come with mating activity and the odor of unneutered males spraying to mark their territory. We still have a ways to go before our ordinance will be written and ready for a public hearing. In that time I am hoping to hear about all the issues and concerns people have so that we can address them as best we can. So please feel free to write to me with more questions or concerns. So far, we have established a working group comprised of city staff, and representatives from Minnesota Spay Neuter Assistance, Audubon Minnesota, the Minneapolis Animal Care and Control Advisory Committee, Minnesota Voters for Animal Protection and the Audubon Chapter of Minneapolis. This group will provide input and feedback as the details of the proposal are developed. It’s clear to me that the current tools available to the City’s Animal Care and Control department are not effectively reducing the numbers of feral cats in Minneapolis. This has many negative consequences for wildlife and livability. I believe that Trap Neuter Vaccinate Return programs may offer a promising, affordable and humane method of reducing feral cat numbers, while also protecting public health and reducing impact on wildlife. If well regulated and operated, I think a TNR program is worth trying in Minneapolis. As with any policy I work to put in place, I will evaluate the success of this initiative. If, after a few years, it proves to have increased rather than reduced the numbers of feral cats in Minneapolis, I will advocate for ending it. The Star Tribune has run the op-ed I authored defending ranked choice voting, which had already been posted on the SecondWard blog here. The 2012 resident survey results conducted by National Research Center, are available online and were presented at the City Council’s Feb. 20 Committee of the Whole meeting. The survey helps me understand the concerns and opinions of residents, in general, and also identify potential needs and priorities for the future. I read through the report carefully and look at trends and changes over years, how respondents from different areas respond and also how we compare with other cities across the nation. I also always look especially carefully at the areas I serve as Council Member. Generally the survey results mesh well with what I hear in my day to day work. The survey indicated, for example, that the people generally like the direction the city is going and that snow plowing and park and rec services are of high priority. I was struck, although perhaps not too surprised, by how different views were between different parts of the City. The survey divided respondents into 11 basic "community planning districts" and it was striking (although perhaps not surprising) that certain parts of the City reported being less satisfied or happy with the city than others. The Camden area, for example, rated their neighborhoods as a place to live lower (60% saying it was good or very good) that those from the Longfellow area (93%). In general, a majority of the respondents, 91%, rate the city as a very good (57%) or good (34%) place to live. Additionally, nearly all residents (96 percent) said they were satisfied (79%) or very satisfied (17%) with the overall quality of City services. Among City services, residents gave their highest satisfaction ratings to fire protection and emergency services (98% were either satisfied or very satisfied), sewer services (96%), 311 for City services and information (96%), park and recreation services (95%), and Animal Control programs (92%). Although a majority of residents were satisfied or very satisfied with all City services, the services that received the lowest ratings were repairing streets (70%, up from 40% in 2011), affordable housing development (70%) and mortgage foreclosure assistance (60%). Because this is the 6th resident survey we can also see trends in some areas, and it appears that in most areas there is improvement. In 2012, for example, more respondents than in previous survey years reported that Minneapolis has gotten better as a place to live. The report calls out two particular areas of focus based on services ranked of very high importance but that were below the national benchmarks: snow removal and providing park and recreation services. Additionally, discrimination continues to be a problem for a percentage of residents. As in previous years (2001 -2011), about one in 6 respondents reported experiencing discrimination in Minneapolis. Most was identified as discrimination based on race or economic status. It was discouraging to learn that more than last year (14% vs 7%) reported experiencing discrimination in dealing with the City enterprise itself. While one must be cautious using and interpreting data from a survey of only 1,378 residents, this does offer us a rare opportunity to get specific data about how resident view our city and city services that we can compare with other years and other communities. Used properly, and with other measures it can inform our planning and priorities for the future. To find the full report and do you own analysis visit here and let me know what you learn. There is quite a lot of misinformation swirling around regarding Ranked Choice Voting. I have tried to bust some of these myths in the memo I circulated to legislators and through an op-ed that I submitted to the Star Tribune and posted earlier on this blog. This is a 'utility post' for RCV myth-busting, bringing together as many of the commonly-repeated myths as I can, and providing a counterpoint from reality. I'll note that I'm not the only one who has had this idea - FairVote Minnesota has also put out a very useful "Myths Vs. Facts" document. Read more below the fold. As you can read here, Xavier Demia Walker, the last of three perpetrators of the horrific murder of Cooper resident Shea Stremcha has pleaded guilty. According to court documents, Walker fired the shot that killed Stremcha. He is expected to be given the maximum sentence, 40 years in prison. I want to thank the Minneapolis Police Department and Hennepin County Attorney Mike Freeman for their good work investigating and prosecuting this terrible crime. The Star Tribune has run two anti-Ranked Choice Voting pieces, one of them a news article and one an Op-Ed. They also ran a very good, pro-RCV commentary from Jeanne Massey, Executive Director of FairVote Minnesota. As a supporter of Ranked Choice Voting and someone who has closely followed its implementation in Minneapolis, I may be able to clear up some confusing information that has appeared in the Star Tribune recently. 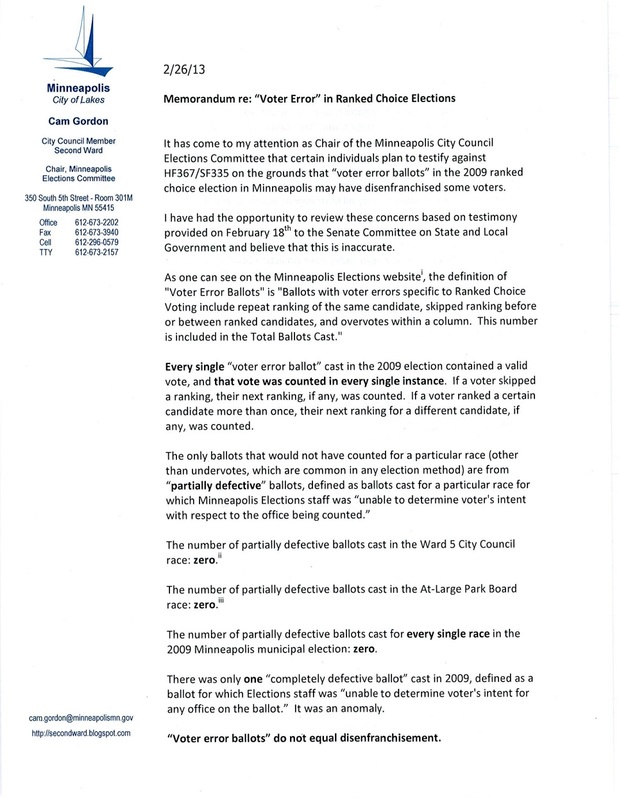 A February 28 article (“Funds for election come up short”) and March 5 opinion piece (“Ranked-choice voting hurts Minneapolis minorities”) contain a number of inaccuracies that warrant correcting. The article claims that “ranked-choice balloting… cost the city five times more than traditional voting.” This is not accurate. The Elections Department spent $1.47 million in 2009, the year of our first ranked choice (RCV) election. They spent $1.12 million in 2005, our last non-ranked choice municipal election year. That’s an increase of less than one third. The article’s assertion appears to be based on a “cost per voter” calculation, but this statistic is changed much more by voter turnout than by actual costs. The cost per voter in the 2011 special election (which used the “traditional” method) was substantially higher than in the 2009 RCV election. Remember, RCV does away with the lowest-turnout elections, nonpartisan primaries, which due to their low turnout also have high costs per voter; in the 2005 primary, only 15% of Minneapolis voters cast a ballot. The article also left out information. One of the drivers for additional funding for this year is the need to have a contingency fund for a hand count in the unlikely event that voting machines are not certified in time for this year’s election. I expect machines to be certified, and the Council is committed to work with Hennepin County and the Secretary of State’s office to make sure this happens. Additionally, the 2013 budget includes non-RCV related supplementary expenses including election judge training for new equipment and anticipated higher voter turnout. Finally, the request for this year’s election of $1,684,446 (including the supplemental request) is in line with the Clerk’s request for future years: $1.4 million in 2014 and $1.6 million in 2016. Only a small share of the budgeted increase is specifically for RCV activities and that is primarily for voter education. In every single case an error was made, either the voter corrected his or her ballot or the elections staff was able to determine voter's intent with respect to the office being counted. The only ballots that would not have counted for a particular race are from “partially defective” ballots, defined as ballots cast for a particular race for which Minneapolis Elections staff was “unable to determine voter's intent with respect to the office being counted.” There were no “partially” defective ballots cast in 2009 and only one fully defective ballot, which had nothing to do with RCV. Every voter who wanted to cast a vote for a particular race in 2009 was able to do so. If a voter voted more than once within a column, the voting machine alerted the voter, who was then able to fill out a new ballot. If a voter skipped a ranking, their next ranking, if any, was counted. If a voter ranked a certain candidate more than once, their next ranking for a different candidate, if any, was counted. The number of partially defective ballots in Precinct 10 of Ward 2: zero. In the Ward 5 City Council race: zero. In the At-Large Park Board race: zero. “Voter error ballots” do not equal disenfranchisement and the city will make that clearer to the public when reporting results this year. Higher instances of errors could be explained in any number of ways and going forward they might point out the need for clearer ballot design and better voter education. But any attempt to equate these voter practices with disenfranchisement, or not having a vote counted, is wrong. The New York Times is out with a new article on cities considering forming municipal power utilities, and Minneapolis is mentioned. I recommend that everyone interested in our energy future take a look. Consideration of Hennepin County’s application to amend their conditional use permit to allow them to increase the amount of garbage they may burn at the Energy Recovery Center in downtown Minneapolis was discussed in February at the Zoning and Planning Committee. The County requested that the matter be postponed for another year, then withdrew the request saying it was not necessary but that they wanted the Council to delay any decision until after the a review by the state Pollution Control Agency (MPCA) was completed. When this came to the Planning Commission over 3 years ago they denied the application. The County then appealed that decision and this has been stuck at the committee level ever since. Additionally, this use is not consistent with some policies of the City’s Comprehensive Plan. Despite my opposition, the committee supported a continued postponement until after the review is complete which may be in as soon as April 2013 or as late and April of 2014. I appreciated that some people were able to attend the meeting and was glad that we were able to take some comment at the committee, but in retrospect, I wish I had been more insistent that we take it before the vote was taken. If and when new information is presented as part of that process I will certainly consider it carefully before taking another vote in the future and will be careful to base my vote on the information in the public record. At this point I am very concerned about the long term health concerns related to the burner. I support more aggressive goals to move us to a no- or zero-waste city and working harder to reduce waste. It is worth noting that under the current practices, even as Minneapolitans reduce waste, increase composting and recycle more, the amount of waste burned at the downtown facility will not change because the county continues to bring waste in from other cities including St. Louis Park and Minnetonka. When this does come back to the committee I look forward to a full public hearing with plenty of notification so that people can plan accordingly. For more information you may wish to review the staff report and check on the MPCA's progress. 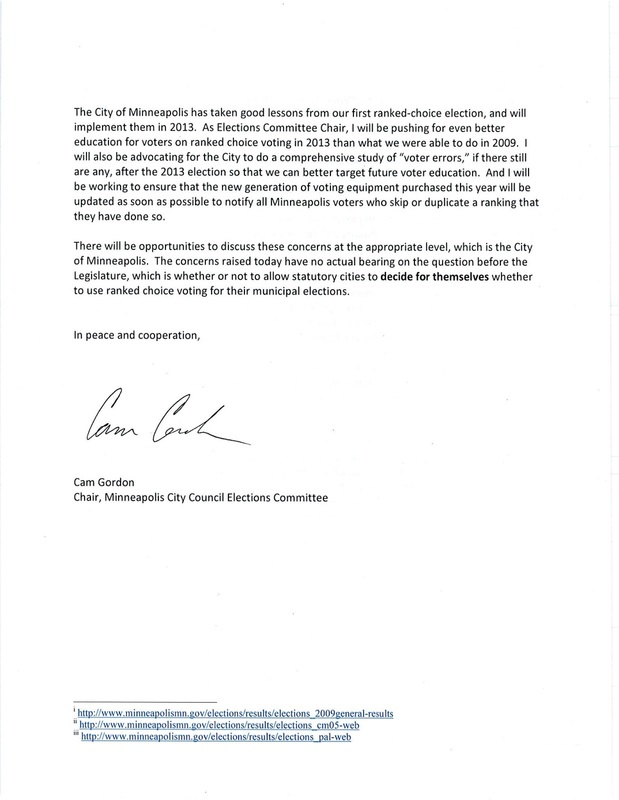 Recenlty, I presented the below memo to a legislative committee considering a very good bill that will, if adopted, allow smaller "statutory" cities that don't have their own charters to use ranked choice voting (RCV) for their municipal elections. This bill has become an opportunity for a set of ranked choice voting opponents to criticize the 2009 RCV election in Minneapolis. They are making the argument that RCV somehow disenfranchises certain communities, and point to "voter errors" in 2009 as proof. They are wrong. No voters were disenfranchised in the 2009 election. This memo is my rebuttal of the misinformation (or, perhaps, deliberate disinformation) they are spreading.